In our fast moving world where it’s become a symbol a status, strength and admiration to be a fast, efficient and multitasking monster. We cram more and more into our lives – at the expense of appreciating the most important, yet common things. Such as enjoying a meal. When was the last time you really paid attention to what you were eating? It’s smell, colour, taste and texture? Eating has become a stressful experience for many, something that needs to be over with, so we can get on with more important things. Often food is consumed standing, on the go or whilst otherwise engaged. We tend to forget, the purpose of eating is to keep our body and mind healthy and alive. “It is health that is real wealth, not pieces of gold and silver.” Mahatma Gandhi. 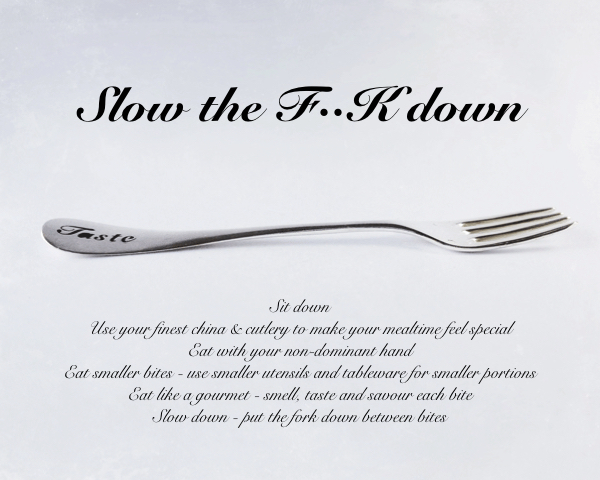 In an attempt to honour my own health, I wanted to create a fork that will remind me to slow down while eating and really taste and savour my food. In order to do so I’ve studied some of the principles of mindful eating, which are said to have a positive effect on your digestion, your waste line and your overall health. Here are 6 practical mindful guidelines to keep in mind when eating. With these 6 guidelines in mind I started to observe my own eating habits, to see what kind of fork would help me to slow down and eat more mindfully. The fork is made from and old french silver fork, as part of my TransForming Treasures project – giving new form to old silver. A benefit from it already being old and used; is that it already has that polished, yet silk worn surface that makes it look precious and loaded with emotional value and family history that makes me appreciate it and make my meal feel more special. I discovered that if I turned my fork upside down, so I could only stab with it, my bites would be smaller. That’s why the fork is almost straight. As a universal rule for habit change: you need to practise and work hard at the change you want to create. Your mind automatically wants to take the shortcut, which means slipping back into what you normally do without thinking about it – so I found I needed a reminder at hand, every time I sat down for a meal. Hence the words Taste & Savour pierced into the handle. I’ve also made a handy little printout of the 6 mindful eating guidelines that sit on my fridge as a reminder. Now, all that is left is practise, practise practise. The forks will be exhibited at Galleri LOD in Stockholm as part of their THE FORK exhibition, 7th – 28th March 2015. In order for new changes to to become habits, you need to do them repetitively everyday for a period of time – the longer the better. The hard part though is getting started. 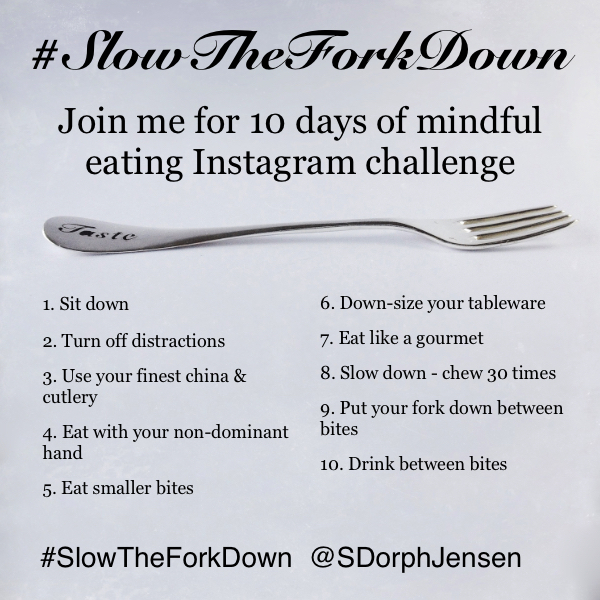 Changes are always more fun if you do them together, so come join the challenge by following @SDorphJensen & #SlowTheForkDown on Instagram for more support and encouragement. Use the 10 mindful ideas for inspiration, one a day, all at once or make your own – however you work best. The challenge starts on Tuesday 3rd February 2015, but don’t worry if you miss a day or so – just jump in and join!